Marine, Navy and combat theater Merchant Marine applicable from President's George Washington to current. Air Force, Army, Coast Guard, Marine Corps, Navy, and combat theater Merchant Marine. 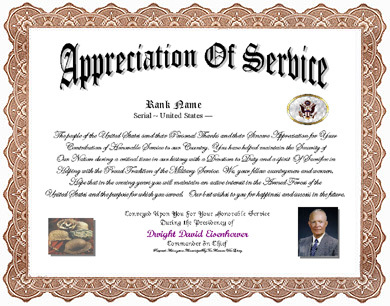 An unaltered photocopy of your DD-214, WD AGO, NAVPERS, NG or other military issued document clearly displaying your award of the Appreciation of Service.